At 10:00 A.M. on 13 Sept 1768—250 years ago today—Boston’s voters reconvened at Faneuil Hall to continue the town meeting they had started the day before. James Otis, Jr., was presiding. My apprehensions that some of his Majestys Troops are to be expected in Boston, arise from information of a private nature; I have received no publick Letters notifying to me the coming of such Troops, and requiring Quarters for them; whenever I do I shall communicate them to his Majestys Council. The Business of calling another Assembly for this Year is now before the King; and I can do nothing in it, untill I receive his Majestys Commands. This reply was weaselly even for Bernard. He’d set off the alarm himself by telling at least one member of the Council and one selectman about the coming regiments, knowing they would spread the news. But since he’d received only a letter from Gen. Thomas Gage in New York, not an official notice from London, the governor refused to say anything more. In a phrase not yet coined, no taxation without representation. Gov. Bernard later complained that the meeting was nothing more than “a Set of speeches by the cheifs of the faction & no one else; which followed one another in such order & method, that it appeared as if they were acting a play, evry thing, both as to matter & order, seeming to have been preconcerted before hand.” Which almost everything certainly was. One cried out that they wanted a Head [I don’t actually know what that means]; this was overruled: for indeed it was rather too premature. Another, an old Man, protested against evry thing but rising immediately & taking all power into their own hands. One Man, very profligate & abandoned, argued for massacring their Enemies: his argument was short.—Liberty is as pretious as Life; if a Man attempts to take my Life, I have a right to take his; ergo, if a Man attempts to take away my liberty, I have a right to take his Life. He also argued that when a Peoples Liberties were threatened, they were in a state of War & had a right to defend themselves. And He carried these Arguments so far that his own party were obliged to silence him. Whereas by an Act of Parliament of the First of King William and Queen Mary [i.e., right after the Glorious Revolution], it is declared; that for the Redress of all Grieveances, aud for Amending Strengthning, and preserving the Laws, Parliaments ought to be held frequently, and in as much as it is the Opinion of this Town, that the People labour under many intollerable Grievances, which unless speedily Redressed; threaten the total distraction of our invaluable natural, constitutional and Charter Rights. This resolution passed unanimously. Boston was ready to host the equivalent of a General Court whether Gov. Bernard cooperated or not. Officially, this would be called a “Convention,” just as the equivalent in 1774 would be a “Provincial Congress.” To represent Boston at the Convention, the town elected the men who represented them in the General Court: Otis, Thomas Cushing, Samuel Adams, and John Hancock. The proposed time of the gathering: “at Faneuil Hall, in this Town, on Tuesday the 22d. Day of September Instant, at 10. O’Clock Before Noon.” The meeting ordered Boston’s selectmen to send invitations to their counterparts in all the other towns of Massachusetts. 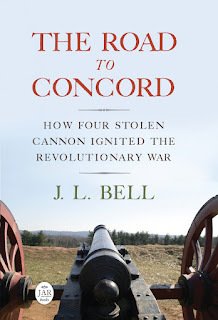 I think this incident points to one of the reasons why the revolution ultimately succeeded - while other revolutions used war as a means to seize power, our founders seized power first by setting up extralegal committees, congresses, etc., and the war "sealed the deal" so to speak.